Sometimes my customers are amazed to hear that InkjetMall is actually owned by a printmaker rather than a businessman or some inkjet conglomerate. But, InkjetMall is essentially an outgrowth of my printmaking activity. I developed what is now known as Piezography in the early 1990s at Cone Editions Press. I then ported that to IRIS Graphics and it was sold as DigitalPlatinum for IRIS (the first quadblack inkjet system.) We make inks for use at Cone Editions Press. Some inks are very custom, and we have a small following of JonCone Studio inks customers. The majority of products sold at InkjetMall are exactly the same products we use at Cone Editions Press. InkjetMall is located just adjacent to Cone Editions Press so that I can divide my time between the two separate companies. If you’ve ever wondered why Dana Ceccarelli is such an expert in inkjet support, it’s because for many, many years she has also been responsible for the maintenance of printers at Cone Editions Press. She’s also a printmaker at Cone Editions Press. And if you get an understanding ear from Wells Smith at InkjetMall, it’s because Wells is also an accomplished artist. Cathy Cone is a painter/printmaker who also divides her time between her studio, Cone Editions Press, and InkjetMall. Both Cathy and Wells participate in the open figure drawing that Cone Editions provides in our community every other Tuesday evening. Cathy Cone introduced this as a way to create a center for the many artists interested in figure drawing in the surrounding communities of Topsham, Vermont. Now on to the prep and print… At the right of this blog entry is a link (or you can click here.) for a 5 minute video I made during the making of a test print for photographer Yatin Patel. The process involves custom made paper produced by a small handmade paper mill in Japan. The paper is extremely thick – perhaps 1/8″ although its surface undulates in both texture and thickness. The paper is produced by pouring the slurry onto the mould and forming it by hand. This is a strong contrast to the traditional method of pulling the screen up and through the wet slurry. If you can visualize someone smoothing plaster with a trowel – that is not far from the process by which this extraordinary paper is made from a mixture of western and eastern materials. This is the same paper maker which produced the enormous 8 x 14 foot sheets of paper on which I printed the Ashes and Snow exhibition prints. Yatin Patel has envisioned a show of his images in which I will produce something that has a very unique look. This paper is warmer in tone than the Ashes and Snow prints and has a totally different ink set that I have created for it. The printing methodology is different as well. It is closer to my own process for my “olden day prints” that I blogged on last year. But, for Yatin I am making more of a pure monochromatic look – with much more subtle split toning. The Roland is set up to print 12 separate inks. But, I am not using any of the color components which are loaded and that you can see in the video. Instead I am using some Piezography Carbon and several custom JonCone Studio muted tone inks. In total, only six of the 12 inks are used for this test print. In the video I am affixing the sheet (which weighs about five pounds) onto a carrier sheet so that I can print over the deckles. I am using a 64″ Roland solvent printer which I have adapted to aqueous pigment inks and which I have raised the print heads, the capping stations, and the cleaning stations to accomodate this thick paper. This printer is now used exclusively for this type of paper. I have milled a number of custom size papers for several clients. And for each client I create a custom ink set or/and printing methodology. This printer pre-heats the paper so that I can load more ink onto it. The paper does not have an inkjet coating. All of my black and white processes start with a grayscale image. What is sent to the printer is a file that has from up to 12 different channels of ink information. I am essentially hand separating the image into “ink curves”. I’m able to visualize what portion of an image’s grayscale values need to be printed in the various inks in order to make a whole. I also have a hybrid of the Piezography profiler to assist me in making these curves which I then transpose to Photoshop. I have to calculate the overlap and total ink limits and this software gives me a mechanism by which to control these important factors. I duplicate the grayscale channel into as many inks that I am printing with. These become spot channels. The curves are applied to each of these spot channels individually. When the image is ripped through ErgoSoft, each spot channel is assigned to an ink in the Roland. Complex but fun. I have no visual interface other than a soft proof that I may make. Essentially, I am pre-visualizing. For me this is as close to the way that I originally made prints when my studio was an intaglio and serigraphy studio (back in the 80s and 90s) – with everything hand separated. Could I automate this in Photoshop or StudioPrint and work with conventional RGB workflow? NO! And even if I could, I would not want to. Printmaking is fun and challenging and filled with accidental mistakes. This process gives me that access again, just as it allows me to devise autographic looking works for my studio clients. You’ll see me clean my print heads by hand with PiezoFlush and a swab. The Roland gives me access to the underside of its print heads. I am able to clean the lint off the edges of each print head so that when it fits into the capping station for “head cleaning”, the suction produced by the capping station will be perfect. But, I also clean the capping stations. PiezoFlush is made here in East Topsham for use in our print studios – but we sell a lot of the cleaning, flushing and storage fluid. Finally, you will see the printer in action at the start up and a few moments of printing over the 44″ x 78″ paper. Enjoy! Jon Cone is the developer of Piezography inks and software. He founded the world’s first digital printmaking studio in 1984. 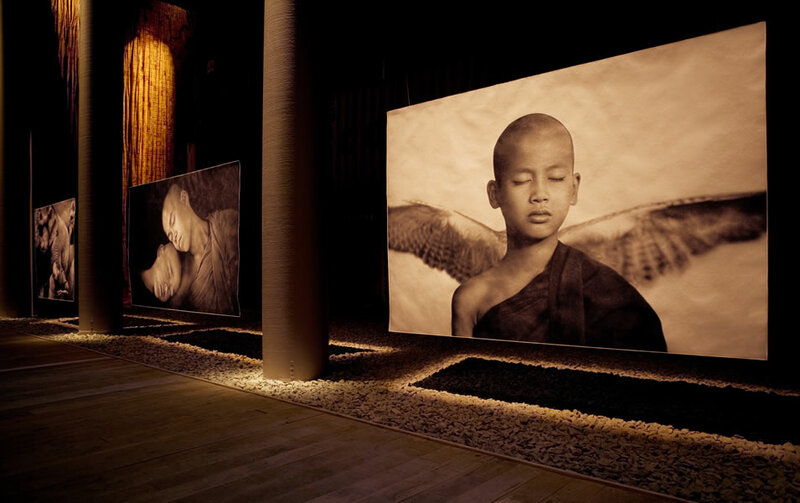 Cone has printed for notable photographers such as Richard Avedon, Gordon Parks and most recently produced the enormous 8 x 14 foot prints for Gregory Colbert’s monumental Ashes and Snow exhibitions. For his own photography, Cone prefers the intimacy of small images. ???? - ???? Awesome! Thanks your sharing! Cone Digital Print Workshops Bring a Friend special offer!